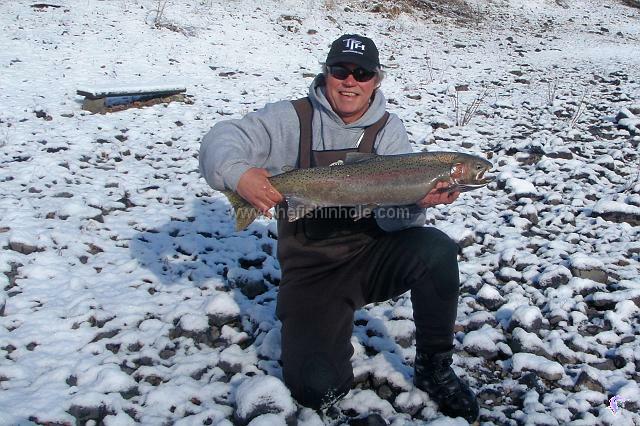 A late winter trip to Idaho's Clearwater River for "B-Run" steelhead. As winter fast approaches here in Alberta, (did we ever get summer? 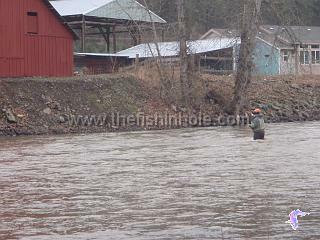 ), thoughts of a long, cold winter disheartens most fly fishers. We will probably be lucky enough to get in a few days on the Bow or Crowsnest, as long as our days off coincide with the much anticipated Chinook winds. 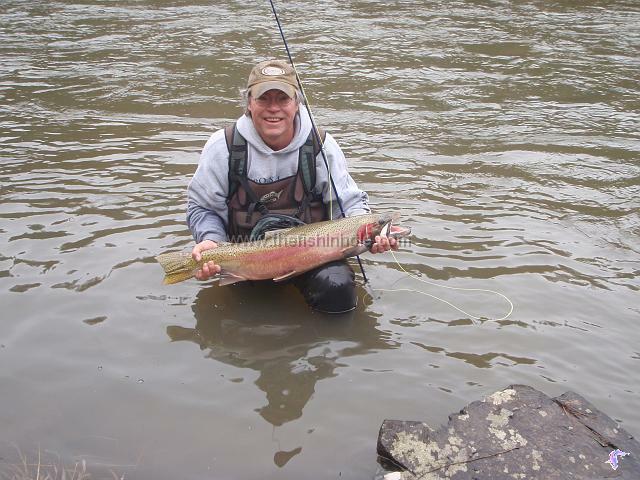 Last winter I was lucky enough to make two winter fly fishing trips, both of which were first time events for me. In late January I travelled to Cuba to fly fish for bonefish and in early March I travelled to Idaho to fly fish for winter steelhead. One of the best things about trips like these is that not only do they give you a break from winter for a week or two but the trip planning and preparations make the time go by a little quicker. As a fly fisher, part of the preparation involves researching the flies that will be needed, and, if you are also a tyer, it means sitting down at the bench for several evenings tying up your final selection. I have always avoided Steelhead fishing because I knew I would love it and quite frankly I cannot afford another addiction added to the growing list of fly fishing afflictions I already have. None the less this trip had it’s beginnings in the living room of the Missouri Riverside Lodge in Montana. During our annual trip to fish Montana’s Missouri River my fishing partner Nick Heemskerk and I were discussing our latest fishing adventures with lodge owner Arnie Gidlow. 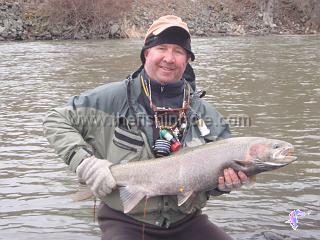 When Arnie pulled out some pictures of fly caught steelhead I knew I was in trouble. It seems Arnie had been catching these magnificent fish for the last few winters while making the circuit of winter Sportsman Shows promoting his lodge. The thing that intrigued me most was that the method used for catching them was dead drift nymphing, not the "chuck & duck" streamer fishing I associated with steelhead. The second thing was the size of the river, perhaps twice as wide as the Crowsnest it would be more like nymph fishing for trout, BIG trout. This would definitely be different than the big brawling rivers in B.C. where most of my steelheading friends visit. Plans were quickly drawn up to meet Arnie in Kooskia, Idaho in early March. I can honestly say that I have never had a December and January pass quite so quickly. Between tying bonefish flies for Cuba and egg patterns of various colours and configurations March came about quite quickly. We left Calgary early on the Saturday morning, leaving us plenty of time to be in Kooskia for our Monday rendezvous with Arnie. We spent Saturday night in Missoula, Montana and Sunday morning headed west on Hwy.12 up over Lolo Pas and down in to Idaho. The weather was perfect and what could have been a difficult journey turned out to be an awe inspiring drive along the Lochsa River, a good cutthroat stream in summer. We arrived in Kooskia, pop 700 +/-, and checked into our motel room. The lady who checked us in updated us on the fishing. The fish were "in", and fishing had been good. When she pointed out some photo’s on the bulletin board that some recent guests had caught, my casting arm started twitching! The South Fork of the Clearwater enters the main river right at Kooskia. The upstream portion that we would be fishing is within the Nez Perce Indian reservation and because of this we did not require a Idaho fishing license, simply a Steelhead permit from the tribe’s Fish & Wildlife Commission. The cost for non-residents, valid from Oct.15 to April 30, was $25.00 and this combined with a motel rate of $57.00, split two ways, was making this a very economical trip indeed. We picked up our permits at the local sporting goods store and headed out to explore the river and get an idea of the access points. Arnie had told us where he usually fished so we headed south on Hwy.13 along the river to the little town of Stites and crossed the river to the west bank. Arnie's spot, or for that matter the river itself, was obviously not a secret. Anglers dotted the bank and several spots held large groups. 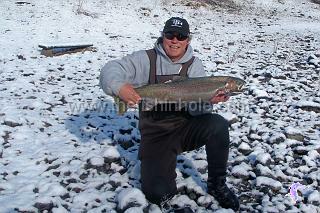 The Clearwater Steelhead that we would be fishing for are called “B-runs”. These are fish that spend two years in the ocean averaging 12 – 20 pounds and are a mix of both hatchery and wild or native fish. You were allowed to keep a couple of hatchery fish which are distinguished by a clipped adipose fin and all native fish must be released. These fish make an amazing journey to get to the South Fork. After entering the Columbia in July they make their way through a gauntlet of dams into the Snake River where they encounter four more dams before entering the Clearwater at Lewiston, Idaho. 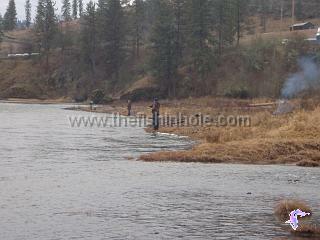 They continue to up river until they enter the South Fork, 7 months and many miles later. 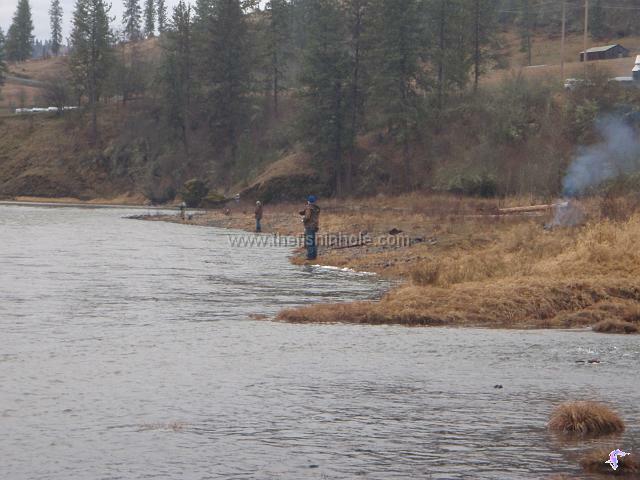 The initial groups of anglers we saw were spin fishing, casting large slip bobber type floats upstream and letting the bait float down through long runs and pools. In some spots there were as many as 10 or 12 anglers in a row which, to me, looked like a recipe for disaster but I saw very few tangles take place. One local told me that the first and last anglers in the group were critical to successful drifts; as long as they had their timing right all would go well. We drove up and down the river and spotted a few stretches that were better suited to fly fishing. Whether or not they were good holding water for the fish was yet to be determined. We had a nice sunny day on Monday and headed back to where we had seen some good looking water the day before only to find three fly fishermen working the run. We watched one of the anglers hook a good fish and after a fight that could only be described as a tug of war we got a look at our first South Fork Steelhead. The way that fish fought was typical of the fish we caught or saw being caught in the next several days. These were not the runners and jumpers I had expected but rather a bull dogging battle with the fish using its size and the current to try to escape. We were welcomed into the run and took our places at the tail end, inching up a little further into the run whenever one of the other anglers took a break. The fishing was exactly like nymphing any river. Two nymphs, or in this case egg patterns, were tied about a foot or two apart, along with a split shot or two, then cast upstream and allowed to dead drift back downstream as close to the bottom as possible. We were fishing 8 wt. rods rigged with floating lines and 2X (10lb.) fluorocarbon leaders. Nick Heemskerk "Matches the egg hatch"
The way these fish fought was the only disappointment of the trip, but I learned a long time ago that fishing trips to unknown waters are always a learning experience. Considering all it was actually quite a successful trip. We caught fish for the next several days and generally enjoyed the whole steelheading experience. Rain on Tuesday night caused the river to rise and dirty a little and we moved a little further upstream looking for some cleaner water. 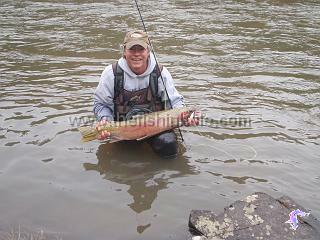 Fishing was still good but wading was little trickier with the water both higher and off colour. A snow storm on Wednesday night made for more Steelhead like conditions, with ice build up on the guides but a fire on the bank to occasionally warm up made it quite bearable. A little snow didn’t put a damper on things. With weather warnings predicting temperatures to plummet and much more snow on the way we headed home on Friday, one day earlier than planned. While road conditions were somewhat less than ideal it was still a pleasant drive back along the Lochsa, over the pass, back into Montana and home.